The initial meeting to form a charitable trust was initiated by Dr. Rahimatsah Amat as early as February 2012. Three supporters of conservation efforts in Sabah were brought together to discuss on the formation of a local-based charitable trust organisation. 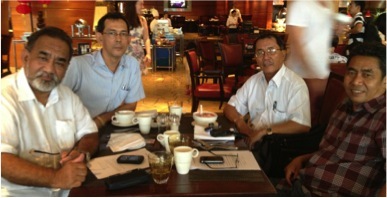 A meeting was held on 12th March 2012 together with the three supporters to form a trust under the Trustees (Incorporation) Ordinance (Sabah Cap. 148). It was then submitted to Amanah Raya Berhad on 6th April 2012 to process the application. ​​The deed for the Registered Trustees of Sabah Environmental Trust (SET) was formulated with the assistance from the State Attorney General’s Office and the State Secretary’s Office. It was officially approved and stamped on 14th August 2012. SET was officially incorporated on 15th August 2012, and the Certificate of Incorporation, i.e. reference PN(SB)(TI) 222/2012, was issued by the state government on 30th January 2013. The Trustees had their first meeting on 14th February 2013 with the appointment of two additional trustees, to form the Board of Trustees. The inaugural Board of Trustees (BOT) meeting was held on 18th March 2013, and followed by the first meeting of Executive Committee (ExCo) on 3rd April 2013.